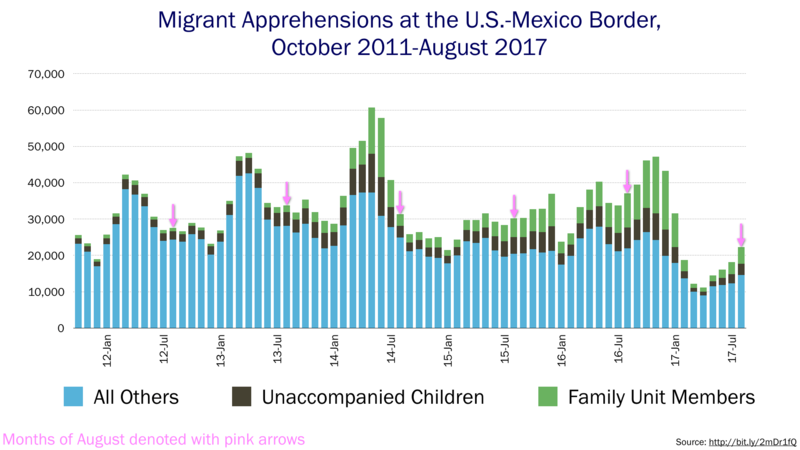 Customs and Border Protection released data yesterday showing a 22.5 percent one-month jump in the number of undocumented migrants apprehended at the U.S.-Mexico border. It’s the fourth straight, and largest, increase since migration bottomed out to decades-low monthly levels following Donald Trump’s inauguration. The August statistic is double April’s. April used to be a significantly heavier month: August is a terrible time to cross the border because of the intense desert heat. But in the past few years, August has been a bit higher. But never twice as high, as in 2017. The number of unaccompanied children, most of them Central American, has tripled since April. The number of members of family units, also mostly Central American, has quadrupled since April. Central America remains one of the most violent places on the planet. After a few months of delaying travel, in “wait and see” mode as the anti-immigration hardline President took over, people are still fleeing that violence. They’re not doing so in the same numbers as before, but more of them are risking the journey. Smugglers may have adjusted to the new reality and are increasing their sales pitches to people who want to leave Central America. In May, then-Homeland Security Secretary John Kelly said that smugglers, perceiving risk under the Trump administration, had raised their rates to $12,000-$15,000. (Migrant shelter personnel had been citing up to $10,000 after Mexico started its “Southern Border Plan” in mid-2014, and about $5,000-6,000 before that.) Such a price hike would have depressed the number of people able to afford the trip, or willing to risk their savings. I wonder if smugglers have lowered their prices since Kelly’s statement. News of immigration raids inside the United States, along with Trump’s rhetoric, has probably kept many would-be migrants in “wait and see” mode, even if they are facing danger at home. But by now it’s probably clear that the United States still respects international standards for those seeking asylum, and that family/child detention remains very rare inside the United States during the years it often takes for immigration courts to make an asylum decision.